We have culled through hundreds of thousands of award recipients in the largest repository of professional recognitions in the world in effort to identify the best of the best. You are in the TOP 1%! Mr. John B. Whalen, Jr., Esq. 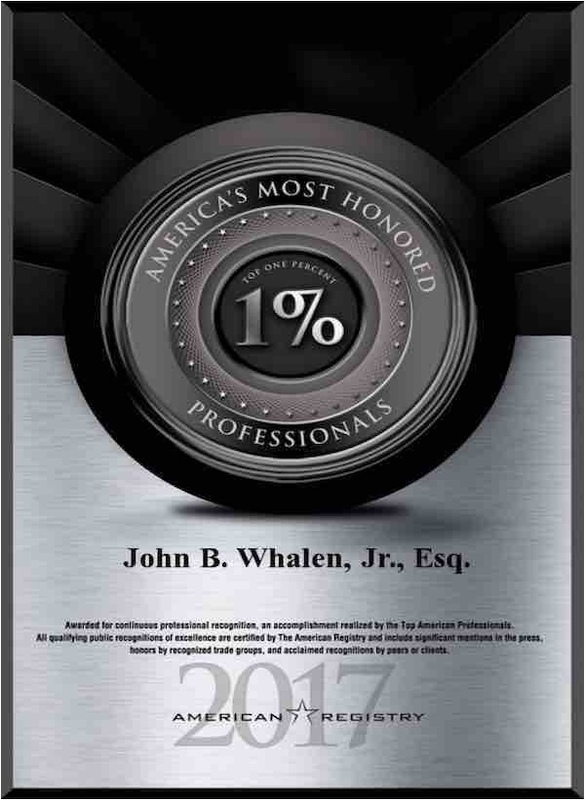 has been honored for excellence as one of North America’s Top Attorneys, an award for continuous professional recognition – an accomplishment realized by the Top 1% of American Professionals. Lawyers recognized for excellence have remarkable professional accomplishments, great peer evaluations and more. Over 1 million North American lawyers work in businesses, government, and privately in solo practices and firms, large and small. Of the very small percentage of lawyers who are ever publicly recognized for excellence, just a handful have been selected as a North American Top Attorney. Mr. John B. Whalen, Jr., Esq. is considered to be one of the best and has achieved this hard-earned recognition. John B. Whalen, Jr., JD., LL.M., is an AV Peer Review Rated Preeminent 5.0 and Avvo Rated 10.0 Superb (obtaining over 95 client reviews and peer endorsements). Mr. Whalen concentratess his three decade career in the legal areas of Pa Probate, Pa Last Wills, Pa Estates, and Pa Estate Settlement. He has been accumulated over 3,967 LinkedIn Profile Followers, 99 LinkedIn peer endorsements, 27 Avvo Peer Endorsements, 24 Martindale Peer Reviews, 12 Lawyers Client Reviews, and 68 Avvo Client Reviews – totaling over 5,000 client and peer reviews.